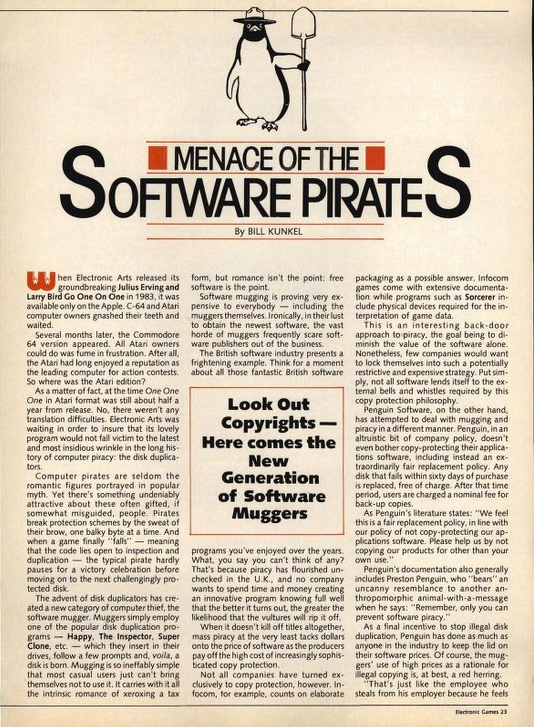 Software Piracy stories at Techdirt. stories filed under: "software piracy"
Two years ago, Techdirt wrote about the major report "Media Piracy in Emerging Economies", which explored how media and software piracy in emerging countries is largely a question of economics: people and companies there simply cannot afford Western-style pricing, and resort to alternative sourcing. That hasn't stopped media and computer companies from demanding that governments around the world should inflict ever-more harsh punishments on their own people. California's Attorney General Kamala Harris has filed a lawsuit against two Indian and Chinese apparel companies for allegedly using pirated softwares in the production of their cloths for exports and to be sold in the state. The complaints allege that the foreign apparel makers who have not paid software licensing fees have a significant cost advantage in the low-margin business of apparel manufacturing, shipment and sales. That seems a pretty big stretch. After all, any savings gained by using pirated copies will be spread over huge numbers of items, and will probably amount to fractions of a cent for each. That difference will be swamped by other factors -- for example, the fact that most fixed and variable costs in India and China are much lower than in California. American software companies have the right to file copyright infringement lawsuits against Indian companies in India under the Copyright Act, 1957 and they have been exercising this right for the last 10 years with a high rate of success. If there's a problem with piracy in India, there are Indian laws and courts there that can and do deal with it. Attempting to enforce US laws in India jeopardizes the existing global legal framework that seems to work reasonably well. Does America really want other governments claiming that actions on US soil have broken foreign laws, and should be tried abroad? For an Indian manufacturer, fighting a lawsuit in Delhi itself can be expensive but defending a lawsuit in California will be at least 20 to 30 times more expensive. It is very likely that just the pre-trial expenses will outstrip the entire cost of the export consignment. The cheaper option is to buy the software licences and this is exactly what the Americans are counting on. They hope to create enough fear amongst Indian exporters that they flock to the closest American software company and stock up on software. This is exactly how copyright and patent trolls work: make the process of dealing with them so expensive and inconvenient it's simpler and cheaper just to pay them off regardless of whether they are in the right. However, this is not how government lawyers are supposed to operate. The more significant fear now is that American software companies operating in India will use such lawsuits to extract not only future licence fees but extortionist damages for prior use of software. If companies start paying up, a precedent will have been created. The model will spread, and the demands for retrospective payments will probably follow, which would lead to considerable capital outflows. Of course, there is one obvious way to solve this problem: encourage local companies to move to open source software, which can be freely copied as many times as desired. It would be rather ironic if the Attorney General's attempt to put pressure on Indian and Chinese exporters backfired in this way, and resulted in less income for traditional software companies in Silicon Valley, not more. When the BSA released its annual report on software piracy, Mike dubbed it "Bogus Stats Again", because as usual it employs plenty of ridiculous methodologies and unfounded assumptions to inflate the supposed economic loss. The BSA doesn't have to worry, though, because most members of the media just obediently parrot their highlighted "findings" without even bothering to read the report, let alone read it critically. 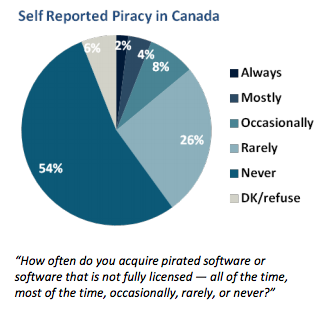 The Business Software Alliance study found that nearly one in three copies of software was unlicensed in Canada in 2011. "If 40 per cent of consumers admitted they shoplift -- even rarely --authorities would react by increasing police patrols and penalties," said Jacquie Famulak, head of the Business Software Alliance Canada committee. "Software piracy demands a similar response: concerted public education and vigorous law enforcement," Famulak said in a news release. For the past few years, the BSA report has repeatedly found that piracy is declining in Canada. In 2009, Canada was characterized as a "low piracy country", in 2010 the industry noted that Canada's piracy rate was at an all-time low, and last year it dropped further to another all-time low. The latest report says the Canadian piracy rate dropped further in 2011. In fact, over the past five years, the Canadian rate has dropped by 18% (from 33% to 27%), the sharpest decline in the world. No other country has seen its piracy rate drop as quickly. Seems like that would have been worth mentioning in a story that gets distributed to news outlets across the country. But instead, we see the same pattern all over the world: Europe, the UK, South Africa, India, Malaya—anywhere the BSA put out a press release. Thanks to some combination of laziness, incompetence and indifference ingrained in the mass-media news cycle, the BSA can say what it wants and rely on the press to be its own personal PR vehicle. For the 9th year in a row, the Business Software Alliance (BSA), an organization that mainly represents Microsoft's interest, has put out its ridiculous "Global Software Piracy Study", which argues that tons and tons of software is being pirated, and if only people paid for it, there would be $63.4 billion more going to software companies. We've been criticizing the ridiculously laughable methodology of the report since it began, and even have seen the company that does the research, IDC, admit that the BSA exaggerates what the report actually says. We've done multiple detailed analyses of how the BSA's stats are misleading (or just flat out bogus). And yet, because there are magical numbers involved, the press just loves to parrot the claims without any skepticism. This year's report is no different. It's more of the same ridiculousness, with a clueless press reporting (totally inaccurately) that the study says that software piracy "costs" the economy $63.4 billion. That's simply not true. What the report did find was not actually surprising or even very interesting. It's that people in developing countries tend to infringe more often. You probably knew that already, but if you wanted evidence for that, you shouldn't look to the BSA and its bogus stats, but a thorough, comprehensive and independent review of the market, such as the one done by Joe Karaganis and SSRC last year. That report found the reason that there was increased piracy in developing markets was because clueless companies don't realize that people aren't going to pay a month's salary for a single digital good. Of course, rather than recognize it's their own business model failings at issue, the BSA is once again using this report to call for "tougher penalties" for infringement. This despite the fact that no study has ever shown that such penalties actually drive more people to buy. Thankfully, at least some people are calling the BSA out on its bogus report, such as by noting that it's political propaganda designed to get legislation like SOPA and PIPA passed. The reality, of course, is that it shows how out of touch the BSA is with the innovation economy today, instead working to lock up and protect the interests of its major funders: Microsoft, Symantec and Intuit. Those companies are threatened by upstarts with better business models, and the best they can do is to support legislation that will lock down the internet, causing more harm than good for true innovation. The "Bogus Stats Again" report from the BSA isn't about dealing with piracy. It's a way of white washing an agenda of protectionism for some large software companies who don't want to compete or to adapt. "This unfairness harms the affected companies and their employees, as well as consumers and the broader economy," the senators wrote. "It also stifles innovation by forcing law-abiding American businesses — large and small — to compete against those businesses that reduce their operating costs through the use of pirated IT." Except that much of that is misleading. First of all, it's unclear that the companies in question would have bought the software otherwise, so arguing that it impacts the software companies isn't necessarily true. It is true that US companies have to compete against those other companies, but is the cost of the software they're using really the difference maker here? Besides, for all types of software there is growing competition from open source alternatives. If US companies want to compete, why not adopt more open source alternatives? Also, what exactly do these Senators think the FTC can do here? The FTC has no jurisdiction over foreign companies and how they operate at home. Finally, even if the FTC could magically stop these companies from using unauthorized software, the end result is likely that those companies would simply shift to alternatives, such as open source software themselves. This kind of article really does demonstrate the old adage, "the more things change, the more they stay the same." Though it's also quite noteworthy that the article highlights some software companies who believe that there are better ways to fight infringement than using DRM. It highlights two alternative strategies: the first is adding additional bells and whistles to the packaging, including various scarcities. The second is by being nice: actively resisting DRM, letting consumers know that, having a really strong replacement policy and keeping prices reasonable. Of course, these are the kinds of strategies that folks are suggesting again today, but which most software firms still seem resistant to embrace. Those who don't understand history may be condemned to repeat it... and without a little copyright infringement to preserve this piece, perhaps we wouldn't even know about that history. While organizations like the BSA and the SIIA play silly games and announce bogus numbers about the "costs" of software piracy, it's nice to see the whole thing beginning to backfire. We've already pointed to the backlash against the BSA for its activities, and now we're seeing how these kinds of crackdowns are doing exactly the opposite of what BSA/SIIA members would want: they're looking for open source alternatives. Following the ongoing "international crackdown" on software piracy, it appears that the Vietnamese government is the latest to start promoting open source alternatives. Of course, for proprietary software makers, this should be seen as worse than piracy. After all, as Microsoft and others have long admitted, you're much better off if someone is using an unauthorized version of your software, than if they're using the competition (especially if that competition is free). If they're using an unauthorized version of your software, then at least there's a chance that they'll either buy it at a later date or convince others to buy it. However, by putting such a big effort into cracking down on software piracy, all the industry has done is highlight why people are better off going with free alternatives. This is a key point we've tried to highlight in the past. The issue isn't piracy at all, but the fact that the competition will eventually learn to embrace "free." Focusing on "piracy" only helps accelerate that process. We've already talked about the BSA's misleading program to get people to turn in their employers for using unauthorized copies of software. Now, sister organization, SIIA, has introduced its own silly program. Reader Jon writes in to let us know that the SIIA is supposedly offering $500 to anyone who "turns in" someone who sold them counterfeit software online. While the SIIA says it hopes that the recipient of the $500 uses it to buy legitimate copies of the software, they don't have to. At first glance, this program looks like it creates a system that gives people incentives to buy counterfeit software. After all, why not buy the counterfeit software, collect the reward and pocket it, while keeping the software? However, if you read the fine print, you'll realize that the program is quite limited. It's not really $500. It's "up to" $500, apparently at the SIIA's sole discretion. And... it's only open to the first 100 people who qualify. And... they'll get to use your name in press releases and force you to post feedback on eBay about how the seller sold you counterfeit software. And... it doesn't appear that you get any amnesty for having the software, meaning you could eventually be liable yourself for using counterfeit software (though, you have to give up the software to the SIIA, but if you installed it first...). Then, there's the best part. If the SIIA winds up in a court case with whoever you turn it, you may be required to testify -- and (wait for it...) the SIIA may reimburse your expenses, but if they do, those expenses will be reduced by the amount the SIIA paid as a reward. In other words, the "reward" simply becomes a prepayment on just some of the expenses you incur to testify on the SIIA's behalf. How nice of them.